You are here: Home > Festive Fives! Pembroke Sefton athletes were singly or collectively churning out the miles on the road or on the steep slopes of Beacon Country Park. There were, however, a scattering of 5K races to be taken advantage of and the Ormskirk Park Run attracted 16 year old Dan Slater, already a Triathlon international, who destroyed the field with an amazing solo time of 15.57. It was the second fastest ever recorded on what is considered a slow course, only 14 seconds off the record. His opponents in the forthcoming championships will have taken note. Kirsty Longley, who is more than double Dan`s age took a last minute decision to run in the Boxing Day Park Race at Crosby. She too left the entire field of men and women in her wake cruising to a 17.31 result. 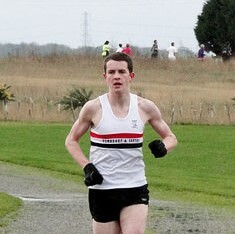 She will be targeting the Merseyside cross country title yet again this coming weekend. Also at the Edge Hill University site Steve Lennon(20.51), Tom Dickenson (21.12), Chris Webber(21.23), first and second females Vicki Jones(21.35) and Anna Hulme(22.25) came away happy. Anna(21.22) had gone even quicker at Crosby. A clutch of senior men were at Halewood led by second placed Mark Wynne(16.33) and a rapidly improving Jonathan Bride in third spot, enjoying a personal best time of 16.50. Aaron Jarvis(17.22) is clearly on his way back. Peter Gaskell(18.54), John Halson(18.55), Chris Pedder(19.40) and Robbie Wood(19.41) also figured prominently. Another of the club`s internationals, Rosie Johnson, was handed a Christmas present in the shape of a call-up to represent the North of England at an Under 20 Cross Country Challenge meeting in Antrim, Northern Ireland in mid-January. Altogether the coaching pair of Mark Bleasdale and Eddie Bairstow can pronounce themselves content that the winter`s training schedules are propelling their athletes in the right direction.